Buy through MusicWeb for £13.90/14.40 postage paid World-wide. As soon as I heard of the release of this disc I was intrigued. Herbert Henck has somewhat of a reputation for highlighting the unusual and under-appreciated pieces in contemporary musical literature, including his stunningly dark and well-recorded works for piano by Avant-Garde Soviet composer Aleksandr Mosolov, recorded in the 1990s for ECM New Series. Regarding the composer, Magne Hegdal, there isn�t a lot of wide-ranging biographical material online to choose from. He received his degree in composition from the Oslo Music Conservatory in 1972 and has been the main music critic for one of Norway�s primary newspapers. Much of his earlier music relies on aleatoric methods, and this to some extent haunts his later output. Hegdal also paints using these methods, one example being the rather minuscule inclusion on the cover. With Herbarium II we have, not a continuation, but a replacement of Herbarium written in 1974, which consisted of 45 "flowers" instead of Herbarium II�s fifty-seven. The earlier version is, according to the composer�s wishes, no longer to be performed. The work is organized into something approximating taxonomic groupings, with six "Families" and a final section of five pieces in the group "Doubles and Variants." Not one of the pieces tops 1:45 and fits comfortably on a page of the printed score. Dynamics and tempo are left up to the performer of the work. 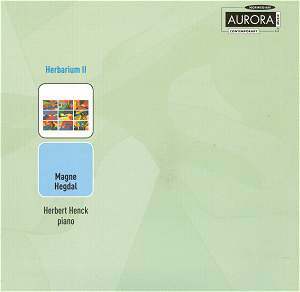 This recording is recommended for those who like piano works to puzzle over. Flower No. 2 "Alea" is a variant of Flower No. 55 Included in the score, as referenced by the liner-notes, is an aphoristic phrase quoted from another composer who appears to be somewhat of a touchstone for both performer and composer: Josef Matthias Hauer (1883-1959): Expression according to colour. This might well be the key to the work, which makes a point of sorting these miniatures in ways that approach the scientific. Another possible foothold is � and this is in the very interesting and helpful notes written by Herbert Henck included in the booklet � a link to Czech composer Reicha. Reicha composed a work entitled The Art of Variation in 1804, his op. 57, which has fifty-seven variations and, with the Hegdal, matches the number of movements in this Hegdal work. Of the works I�ve reviewed recently, this one holds the greatest potential for rewarding close study of the score. The soundworld that this piece inhabits fits best in the atonal works of the avant-garde, with a good deal of alliance to the Russian avant-garde composers of the Teens and Twenties, Lourié and Roslavets being two examples. The piece could be seen as a sort of new Ludus Tonalis, minus the contrapuntal aspect. The recording quality of this release is very good, rivalling that of the ECM discs Henck has produced earlier. The listening is challenging, but rewards close study. The works don�t give up their secrets easily, but that, to a great extent, is an important part of the listening.